Presented on the date of the massacre!! Sally (Marilyn Burns) hears that her grandfather's grave may have been vandalized, she and her paraplegic brother, Franklin (Paul A. Partain), set out with their friends to investigate. After a detour to their family's old farmhouse, they discover a group of crazed, murderous outcasts living next door. 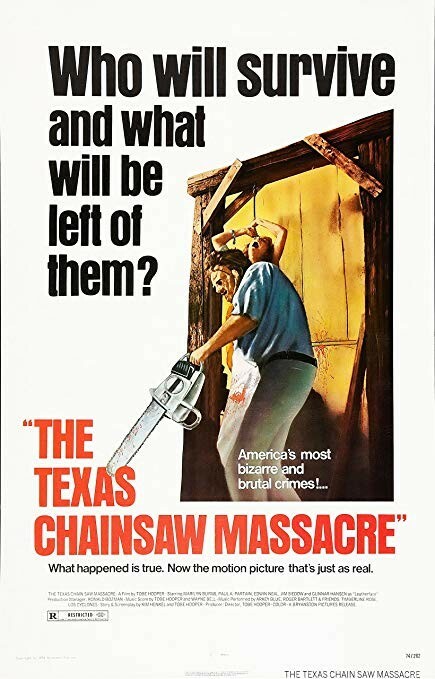 As the group is attacked one by one by the chainsaw-wielding Leatherface (Gunnar Hansen), who wears a mask of human skin, the survivors must do everything they can to escape.